The measured quantity is the fraction of crystalline material in a polymer material. Extendible down to 0.2% if accurate determination of amorphous contribution is available (e.g. using thermal protocols). Figure 1. Crystalline fraction obtained here is of 1.1%. The subtracted curve (blue curve) is obtained by subtraction of the semi crystalline sample scattering curve and the amorphous scattering curve. The figure shows that the subtracted curve is almost noise free, leading to an accurate determination of the crystallinity. Lower crystallinity values can be easily reached. XSACT analysis software implements the above methods. Why use WAXS for crystalline fraction determination ? WAXS does not depend on difficult baseline determination or inaccurate thermal protocols. 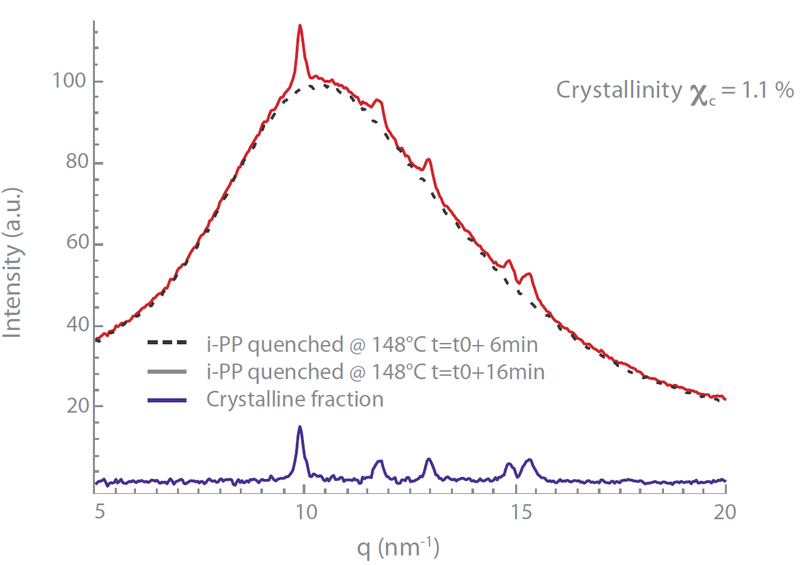 If highest accuracy requires thermal measurement, it is not a prerequisite: determination of crystallinity level is possible even from a single measurement at room temperature using wide knowledge of typical amorphous scattering contributions. 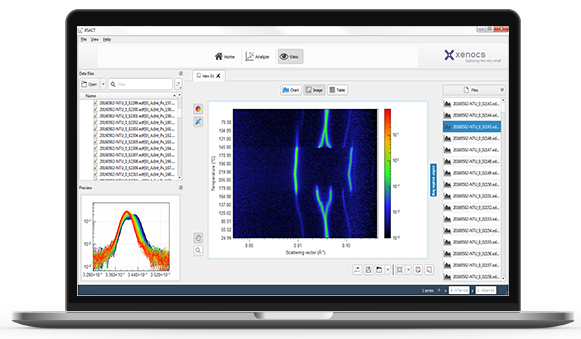 With Xenocs SAXS/WAXS solutions, you get absolute determination of crystallinity fraction, with no assumptions. You get statistical properties averaged over the whole scattering volume (1 mm3). With WAXS, no sample preparation is required. All these measurements are possible directly in your lab.